If your water heater goes out of commission, it can cost hundreds if not thousands to replace. Texas Premier Plumbing’s License plumbers can provide the repair and maintenance services needed to keep your water heater running properly. In addition to ensuring that you have enough hot water for your whole family to shower in the morning, having a properly maintained water heater can also prevent dangerous situations like gas leaks or bursting tanks. We can also help you save money by proving you with tank-less upgrades and installations. If you are growing weary of cold showers, give Texas Premier Plumbing a call and ask about our water heater services today! Texas Premier Plumbing Water Heater Service would like to remind you that sometimes it does not make sense to spend money repairing your existing water heater (or if your water heater is not safe or up to city code) we will recommend an affordable water heater replacement. Texas Premier Plumbing Licensed Plumbers recommend to check your water heater at least once per year for a longer-lasting water heater. Are you looking for Water Heater installation or Repair in the Houston Metro ? In Our Houston Metro there are many types of water heaters. 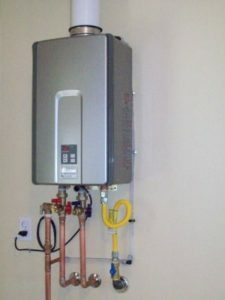 Texas Premier Plumber have repaired for our residential customers Tankless water heaters as well as gas and electric. Our commercial Plumbers can help with all sub varieties. Most residential conventional gas and electric units typically have tanks that store hot water for convenient use when needed. However, not all electric units store hot water in a tank some are Tankless. Tired of waiting for hot water ? Texas Premier Plumbing know that when you open your hot water and out comes cold water you get frustrated!. Our Plumber are here to help. If you are tired of the waiting time call us today. 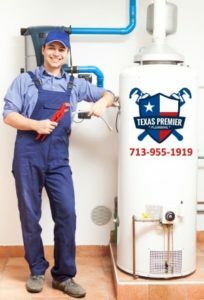 Texas Premier Plumbing will inspect your water heater and will provide you with solution for the problem, should you chose to Repair your water heater or Replace your water heater within no time we will get you hot water back in your home. Our license plumbers can provide you with instant hot water. Just give us a call at 713-955-1919 to solve this issue. Our license plumbers can install, maintain or replace a water heater. No matter the type of water heater, we are equipped to handle the job. With 5 stars reviews on all major websites, choosing Texas Premier Plumbing is without a doubt the right company to repair or replace your water heater.